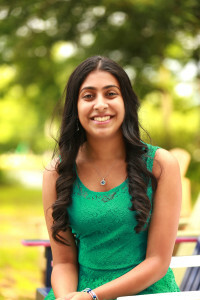 Deepika Kurup is a 17 year old freshman at Harvard College. She has been passionate about solving the global water crisis ever since she was in middle school, as she was exposed to the water problem at a very early age. Recognized as “America’s Top Young Scientist” in 2012, Deepika won the grand prize in the Discovery Education 3M Young Scientist Challenge. She was also invited to present at the 2013 White House Science Fair. Early in 2014, she was honored with the “United States President’s Environmental Youth Award” for her environmental stewardship, given jointly by the White House Council on Environmental Quality and the Environmental Protection Agency. Also in 2014, Deepika won the U.S. Stockholm Junior Water Prize —the most prestigious youth award for a water-related science project — and represented the U.S. at the international competition in Stockholm, Sweden, during World Water Week. The Walden Woods Project recognized Deepika with the 2014 Environmental Challenge Award, and Action for Nature presented her with the 2014 International Young Eco-Hero Award. Most recently Deepika was named one of the 2015 Forbes’ “30 Under 30: Energy”, and was the National Geographic Explorer Award Winner in the 2015 Google Science Fair. Along with research, Deepika is passionate about STEM education, and feels that STEM education has the power to revolutionize the world. In her free time she enjoys giving talks and writing articles to encourage students all around the world to pursue science, technology, engineering and math, and to increase awareness of the global water crisis. Deepika has presented at schools around the world, given invited presentations at national and international conferences, and at two TEDx events. She currently has two patents pending, one of which has been published by the USPTO. Deepika is also an ardent fan of martial arts, and has black belts in both shaolin kempo and taekwondo.